Rosacea is an inflammatory disorder of your facial skin and shares some similarities to acne but it also has some distinct differences. Whereas acne is mostly a skin problem related to excessive production and sloughing of keratin which then clogs your pores leading to inflammation and breakouts, rosacea is more a problem of a dysregulated immune system which manifests in susceptible individuals under certain conditions. How do you know if you have Rosacea? Rosacea often begins as redness on your cheeks, nose, chin or forehead. Sometimes you might see this redness on your neck, ears, scalp or even your chest. Early in its course, you may only notice these symptoms when you are overheated, immediately after exercising or if you are blushing. These early symptoms may come and go. However, over time, you may notice these annoying symptoms more frequently, persistently and severely. Over time you may notice enlarged blood vessels may on your face. You may start to develop pimples or other bumps on your facial skin. Your nose may start to swell up and become bumpy and edematous, this swollen nose condition is known as rhinophyma. Other symptoms may include eye irritation manifesting as bloodshot and watery and itchy eyes. Your face can become swollen, itchy, burning and irritated and you may also develop raised red patches and areas of rough, dry skin. You may experience various manifestations of each of these subtypes either at the same time or one after the other. These symptoms may wax and wane as you experience flare-ups and remissions. While the exact cause of Rosacea is somewhat of a mystery, there are many clues and theories that point towards certain underlying factors. 1. Hypersensitive blood vessels that easily dilate under certain conditions like heat, after exercising and blushing. This may be related to having excessive parasympathetic nervous system activity. 2. Genetic predisposition – Rosacea, like all diseases has some genetic component to it and therefore may “run in your family”. 4. Cathelicidin – this is a pro-inflammatory immune system protein that has been found to be elevated in people suffering from Rosacea. In those persons suffering from Rosacea there is another enzyme in their stratum corneum called sratum corneum tryptic enzymes (SCTEs) which can lead to an accumulation of Cathelicidin. 5. Abnormal vitamin D metabolism – If you have an overactive immune system, you will overproduce a special form of vitamin D known as 1,25 dihydroxyvitamin D (calcitriol). Calcitriol will act synergistically with Cathelicidin to cause enhanced release of pro-inflammatory chemicals (cytokines) which clearly exacerbates Rosacea symptoms. 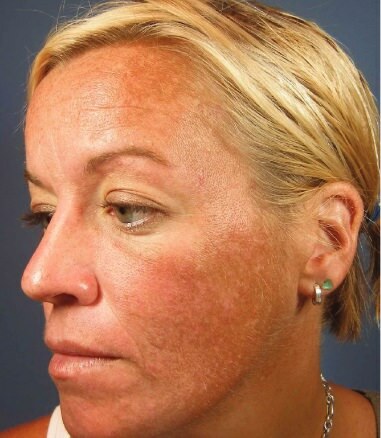 Dermatologists and plastic surgeons focus on treating symptoms of rosacea. These doctors will prescribe antibiotics both orally and topically, recommend pulsed light therapy to reduce redness from dilated blood vessels, moisturizers and sun screen for dry areas of your skin, artificial tears and antibiotic eyedrops for dry, irritated eyes, and cosmetic surgery for thickened and bumpy skin lesions. While these treatments may make you feel and look a bit better, none of them actually address the cause of rosacea nor do they change the course of your disease. A more holistic, natural approach to addressing manifestations of rosacea would be to rectify those metabolic abnormalities that cause this problem in the first place. 1. Healthy Diet – eliminating foods from your diet that contribute to inflammation – sugars, excess carbohydrates, food additives, fried foods, vegetable oils (like canola, soy and corn oil), artificial sweeteners (like aspartame and sucralose), nitrates and nitrites and other pro-inflammatory substances. 2. Metabolic Therapy – Directed towards your metabolism to reduce any imbalances (whether immune, hormonal or nervous system) that can contribute to your disease. Carefully applied exfoliative therapies can be useful to remove some of the epidermal surface abnormalities associated with rosacea. Bear in mind, however, that any and all topical treatments for rosacea must be carefully applied so as not cause additional inflammation.